The Schneider Optics 1072704 CINE-XENAR III Lens is an 75mm lens with a Canon-Mount that is designed for digital Cinematography, and covers a Super 35mm frame. It is part of a range of available lenses that includes 18, 25, 35, 50, 75 and 95mm. This lens shares the same optical and mechanical characteristics as the other lenses in the set, making switching between lenses virtually seamless. These lenses feature a Telecentric imaging design, the same dimensions, and focus/iris gear positions. The focus ring rotates through 270°, and this lens features an aperture range of T2.0 to 16. Each lens is optically coated to improve transmission and contrast, and features an 18-blade iris, for a natural and pleasing Bokeh. This lens features a Canon EF-S mount with a focus scale in feet. The lens easily covers a Super 35mm film frame with an image circle of 31.5mm. 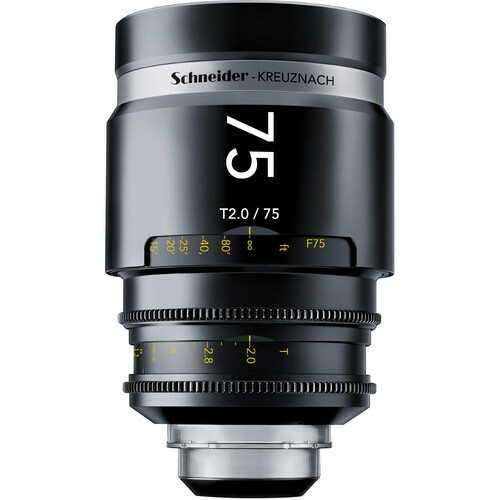 The lens can be used with 2K/4K/5K Cinema cameras. The lens features a Telecentric design, which provides even illumination across the digital sensor, and avoids darkening in the corners of the image. The 18-blade iris forms a round shape, this round iris shape causes out of focus highlights, such as candle flames or bright light sources, to appear round in shape. The design of the lens adds a pleasing Bokeh to the image, lending a more naturalistic feel to the image. The lens exhibits virtually no breathing when changing focus, minimizing distractions to the audience. All lenses in the range feature an advanced optical coating, to increase light transmission and provide excellent contrast. Lenses are color matched to a standard at the factory, and so you do not have to buy a matched set, and can build your lens set over time. The matched color also means that you do not have to worry about a color shift when switching lenses. The lens close focus to 18" (0.45 m) from the sensor plane. The focus ring features 270 degrees of rotation, allowing for precision focus adjustments. This lens shares the same dimensions with all the other lenses in the Cine-Xenar III series, which means a minimum of adjustment and down time when swapping lenses. The iris and focus gears are in the same position on each lens in the series, making lens changes quicker because you do not have to reset the follow focus or iris motors for each lens. Focus scales are available in either feet or meters, and can be interchanged. Box Dimensions (LxWxH) 13.0 x 8.4 x 6.8"